Who hasn’t heard of the ancient, Neolithic structure situated in the county of Wiltshire, high on Salisbury Plain in England? Its massive stones, broken and fallen from age, have stirred the imagination for centuries. There is nothing quite like this famous prehistoric monument anywhere else in the world. Or is there? Near the town site of Maryhill, Washington, three miles east of Maryhill Museum of Art, stands a full-scale replica built by museum founder Sam Hill. Stonehenge Memorial lies at the original Maryhill town site, three miles east of the Maryhill Museum of Art just off Highway 14. Samuel Hill’s crypt is located a short walk southwest of Stonehenge on a bluff overlooking the river. Both Stonehenge Memorial and the Klickitat County Veterans’ Memorial are open daily 7 a.m. to dusk. Admission is free. Each year, we hold a small memorial ceremony on the anniversary of the death of each of the 14 men honored at Stonehenge Memorial. The public is invited to join the Maryhill Museum of Art staff and friends in honoring these men. 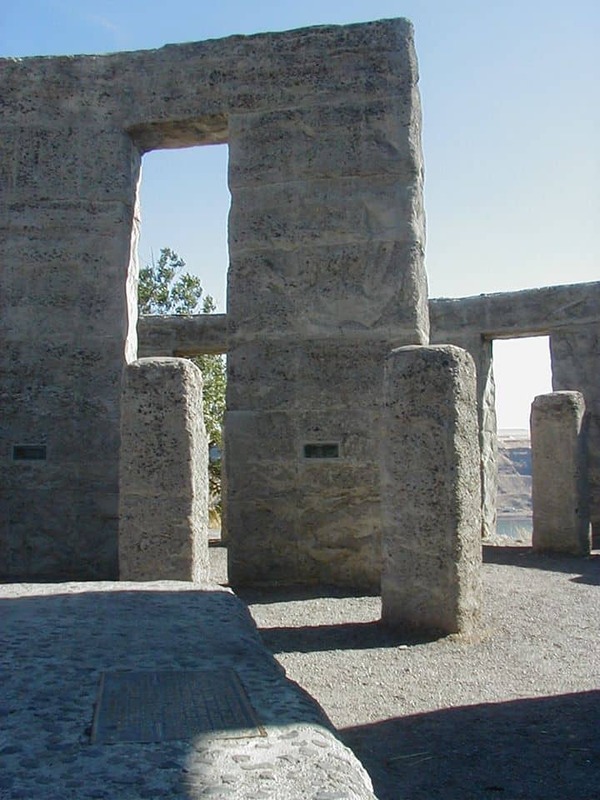 Erected as the nation’s first WWI memorial and dedicated in 1918 to the servicemen of Klickitat County, Washington, who died in the service of their country during the Great War, Hill’s Stonehenge Memorial is a monument to heroism and peace. Hill erroneously believed that the original Stonehenge was constructed as a place of human sacrifice. 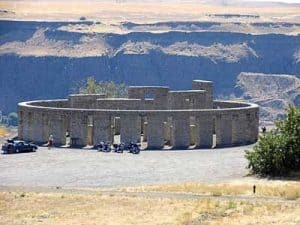 Concluding there was a parallel between the loss of life in WWI and the sacrifices at ancient Stonehenge, he set out to build a replica on the cliffs of the Columbia as a reminder of those sacrifices and the “incredible folly” of the war. Guided by leading authorities on archaeology, astronomy, and engineering, Hill combined their knowledge to duplicate, as nearly as possible, the original size and design of the ancient Neolithic ruin in England. On June 8, 1918 a total eclipse of the sun was predicted, with the best viewing point in the vicinity of Goldendale, Washington. Consequently, some of the best astronomers of the day were in Klickitat County. Professor Campbell, of Lick Observatory at the University of California, agreed to fix the position of the altar stone. Unlike the ancient Stonehenge, it is aligned to the astronomical horizon rather than the actual midsummer sunrise. This results in a three degree difference from the original structure. Combined with a five degree difference in latitude and the manner in which the surrounding hills obscure the actual horizon, Stonehenge Memorial is difficult to use as an astronomical calendar. 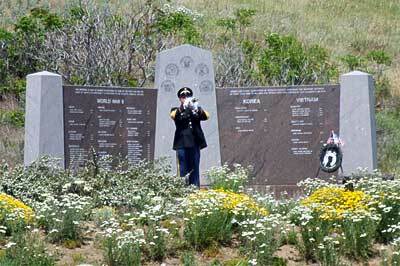 To the memory of the soldiers and sailors of Klickitat County who gave their lives in defense of their country. This monument is erected in hope that others inspired by the example of their valor and their heroism may share in that love of liberty and burn with that fire of patriotism which death alone can quench. Stonehenge Memorial was completed in 1929 and re-dedicated on Memorial Day of that year. The men honored at Stonehenge are James Henry Allyn, Charles Auer, Dewey V. Bromley, John W. Cheshier, William O. Clary, Evan Childs, James D. Duncan, Harry Gotfredson, Robert F. Graham, Louis Leidl, Carl A. Lester, Edward Lindblad, Henry O. Piendl and Robert F. Venable. These men, all members of the American Expeditionary Force, represented the U.S. Army (Calvary, Coast Artillery, Engineers and Infantry), U.S. Marines and the U.S. Navy. In 1995 the Klickitat County Veterans’ Memorial was erected near Hill’s Stonehenge to honor those who have died in service of their country since WWI. The project was a partnership between Maryhill Museum of Art and the Klickitat County Veterans Association.